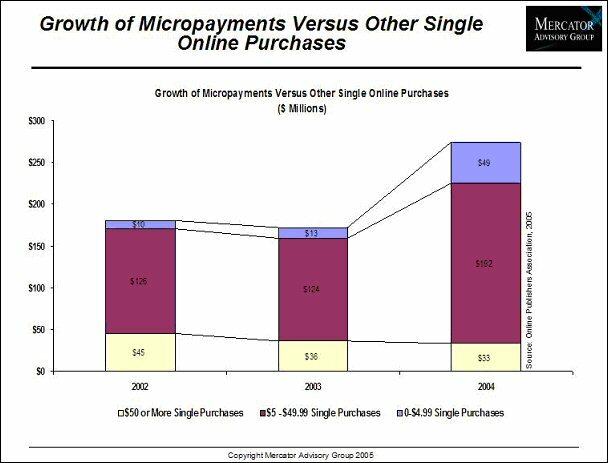 This individual Report Anticipating Micropayment Growth is available for purchase. This Report is available to members of Mercator Advisory Group’s Emerging Technologies Advisory Service. Please be advised that this Report is normally part of a research and advisory service that provides ongoing support throughout the year. As such, this Report contains significant depth of content that is selected for its strategic importance to our members. (For a description of these services, see our Advisory Services section). Over the past year, the number of micropayments transactions processed over electronic networks has skyrocketed. Sub-five dollar sales of online digital content and mobile content showed significant growth from 2003 to 2004 and no signs of slowing down. Indeed, mobile micropayments grew from roughly $2 billion to $5 billion between 2003 and 2004 while micropayment purchases of digital content over online channels grew at a rate of over 250 percent for the same time period. In the physical world, the transformation of traditional small dollar cash only payments to electronic micropayments is driving growth in what has been predicted to be a trillion dollar market. "The number, volume, and growth of micropayment transactions is pretty staggering on the surface. We've tapped a rapidly growing market for transactions that has become a must have in the arsenal of electronic network providers," according to Mike Friedman, Director of Mercator Advisory Group's Emerging Technologies Service and lead analyst on the report. "There is a wealth of opportunity for dedicated micropayment processors and traditional network players, and we have only scratched the surface." In Anticipating Micropayment Growth, Mercator Advisory Group examines the current state and potential for growth of micropayments. The report features data on micropayment transactions occurring online, over mobile networks, and in the physical world. Digital content data is broken out by market segment updating previous Mercator Advisory Group research on micropayments. The report also highlights trends in the payment industry driving micropayment growth and identifies specific technologies and segments likely to provide additional growth opportunities. In addition to current volumes and micropayment growth, Mercator Advisory Group's latest report explores changes to interchange rates and transaction fees by some electronic payment network providers. New rates and fees focused on generating volumes in the micropayment and small dollar space come on the heals of contactless cards and POS technology, but are likely to increase adoption of card payments for sub-five dollar purchases. Finally, the report identifies the leading players in the micropayment market. The report is 24 pages and contains 7 exhibits.